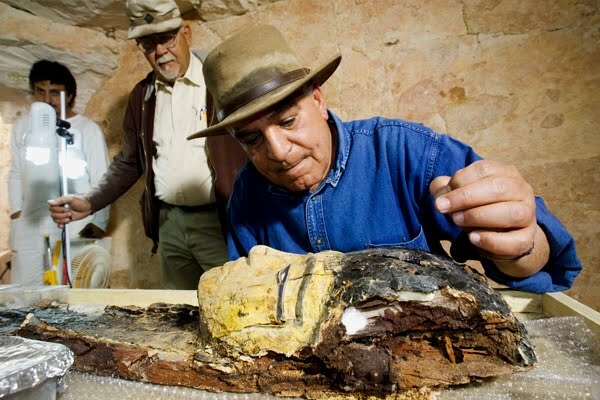 Egyptology is not only a search for knowledge — it can also be great fun, writes Zahi Hawass. I have had countless adventures in archaeology in my life that have made it much more fun. One of the greatest moments was when I entered the queen's subsidiary Pyramid of Menkaure, the Pharaoh who was the builder of the Third Pyramid at Giza. This pyramid had never been entered by anyone since 1902. After I had descended about 30 metres underground, I began to return to the surface but realised I could not because the entrance was sloping. When I moved up, I found myself going down. It was a very difficult task. I also recall incidents that occurred when I was working at the Temple of Taposiris Magna in Alexandria some 35km west of the city. The head of the mission excavating there, Kathleen Martinez from the Dominican Republic, believed that Cleopatra and Mark Antony were buried inside the temple, which was connected with the worship of the Ancient Egyptian goddess Isis. We have been cooperating with her for the last eight years, and major discoveries have been made. Two accidents happened to me at this site, almost as if Cleopatra did not like me. In the first, I was clearing a statue found inside the temple and was leaning over it when a huge stone weighing 20kg suddenly fell on my head. Fortunately, the stone was not too high above my head because it would have killed me if had been. However, I felt dizzy and went to my office in Cairo, telling my assistant Nashwa Gaber that there was something wrong with one of my eyes. We went to see a doctor who told me I had macular hole in one eye and would have to fly to the United States for surgery. The second incident also happened at the temple. I had found a tunnel and thought that the entrance of a tomb was at the end of the shaft. I went down five metres and began to see that the tunnel narrowed. Later, the team prepared a machine connected to a basket in order to lower me down until I had reached 20 metres in depth. Then, I looked down and realised that the space was filled with water. I asked the team to haul me back up, but the machine broke down for an hour. It was the most difficult adventure of all. However, I would like to recount another escapade here that I undertook with former students. While I was teaching at the American University in Cairo, I told my students that I was taking them on an adventure. We were going inside a pyramid that only a few Egyptologists had ever been inside. In fact, some archeologists who specialise in pyramids had never entered this pyramid, I said. We met in front of the Bent Pyramid at Dahshour, and I explained its history and archaeology. My class also had the wonderful surprise of meeting Rainer Stadelmann, former director of the German Archaeological Institute in Cairo. Rainer has dedicated his life to excavating Senefru's Pyramid, and he has discovered many interesting monuments and is believed to be among the best German scholars. He has also made solid friendships with many Egyptians. I told my students that Rainer was one of the few archaeologists who know a lot about the pyramids and that he had discovered the oldest capstone, belonging to the North or Red Pyramid of Senefru. I send him my greetings in his old age and hope he enjoys ankh-wadj-seneb, or prosperity and health as the Ancient Egyptians used to say. Leslie Warden, one of my former students who is now an Egyptology professor, asked me why Senefru had four pyramids. "We do not know, but this great man, Rainer, will give you the answer," I said. Rainer explained that Senefru had built a pyramid in Sila in Fayoum. However, this does not have a burial chamber, and so most scholars believe that it represents a primeval mound and was built behind the king's palace. Senefru started building a second pyramid in Meidum as a step pyramid, but he did not finish it for unknown reasons. Many tour guides still believe that this pyramid belonged to Huni, the last king of the Third Dynasty. Senefru then went to Dahshour and built the Bent Pyramid. Its original angle of inclination was 54° 31¢, later changed to 43° 21¢. It is for this reason that it has its famous "bent" shape. Senefru then moved north and built the first true pyramid in Egypt. Finally, he returned to Meidum and completed that pyramid as a true pyramid. We now believe that Senefru ruled for more than 54 years. We eagerly awaited our adventure with the 12 young students who would enter the Bent Pyramid for the first time. We reached the entrance at a height of 11.8 metres. I climbed up first, with my famous hat on my head, and I could hear Leslie laughing and talking to her colleagues while some of the students were silent. Photographer Marli Pope was ready to take photographs with her digital camera for my website. We entered a tunnel that was about 80 metres long and only 1.1 metres high. Feeling hot and sweaty, we had to hunch over as we made our way to the corbelled room inside. Once there, I began to think of the first engineer who had cleared and worked inside this pyramid, Abdel-Salam Hussein. He believed that secret chambers had yet to be discovered. I warned the students in advance that we would have to climb 6.25 metres up the south wall on wooden stairs that were very difficult to climb in order to reach the floor at about 12 metres. This led to another tunnel, heading to the east and west. We went to the east and found a portcullis in the room of another burial chamber. We were also surprised to find cedar wooden beams, which was something a mystery. Leslie observed that "this wood may be from that which Senefru brought from Byblos in ancient Lebanon." Our last surprise was when we found what the 19th-century explorers Vyse and Perring had detected when they visited the site on 15 October 1839. We could feel that cold air was coming from the interior of the pyramid and going outside. This might be evidence that one of the rooms connects to the exterior, as was seen by the late great archaeologist Ahmed Fakhri. It may be that part of the interior of the pyramid has yet to be discovered. The interior is also very different from others we had entered before. It was all very exciting and something of a thrill. "We will all return to the States and think back on our adventures inside the Bent Pyramid," said one of the students, Kristin Eakins. I had another problem, however. As a result of my exertions I could not move my legs for three days.